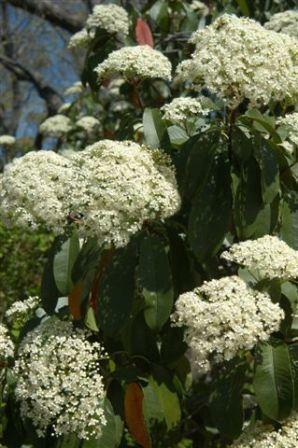 HABIT: Massive, spreading evergreen shrub. Can be trimmed into small tree. 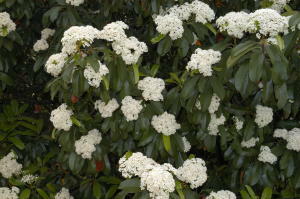 Clusters of white flowers in spring and red berries in winter. CULTURE: Any soil, low water and food requirements. USES: Background, screen, small garden tree. PROBLEMS: Poisonous, powdery mildew, aphids, borers, leaf spot, and fireblight. NOTES: Native to China and Asia. 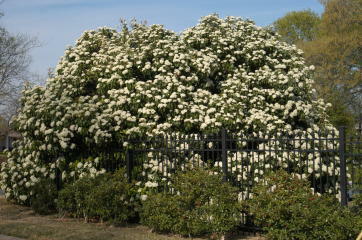 Larger growing than Fraser’s photinia. 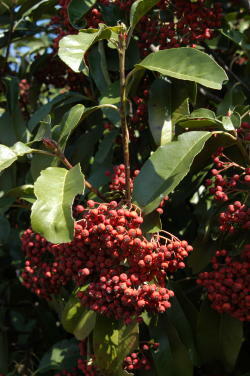 Chinese photinia is far superior to the red tip Fraser photinia.